69% of Chelsea’s matches had over 2.5 goals scored in Premier League. Fulham have lost their last 5 away matches in Premier League. Arsenal have been undefeated in their last 11 matches in Premier League. Tottenham have scored in 100% of their away matches in Premier League. 60% of Liverpool’s conceded goals occurred after the 75th minute in Premier League. 73% of Everton’s points have been earned at home in Premier League. Tottenham have won their last 5 away matches in Premier League. Chelsea conceded at least 1 goal in 71% of their home matches in Premier League. Fulham conceded at least 1 goal in 100% of their away matches in Premier League. 75% of Arsenal’s goals have been scored in the second half in Premier League. Tottenham have scored 65% of their goals away in Premier League. Fulham have conceded the opening goal in 77% of their matches in Premier League. Arsenal have scored in each of their last 12 matches in Premier League. Tottenham have scored the opening goal in 85% of their matches in Premier League. Tottenham were leading at halftime in 62% of their matches in Premier League. Fulham have scored 64% of their goals in the first half in Premier League. Arsenal conceded at least 1 goal in 71% of their home matches in Premier League. Tottenham have been undefeated in their last 5 away matches in Premier League. 62% of Arsenal’s conceded goals occured in the first half in Premier League. Tottenham have scored in each of their last 8 away matches in Premier League. Liverpool did not concede any goal in 83% of their home matches in Premier League. 80% of Liverpool’s conceded goals occured in the second half in Premier League. 64% of Chelsea’s conceded goals were conceded at home in Premier League. 69% of Fulham’s matches had over 2.5 goals scored in Premier League. Liverpool have scored the opening goal in 85% of their matches in Premier League. Chelsea have scored 39% of their goals after the 75th minute in Premier League. Fulham conceded at least 1 goal in each of their last 13 matches in Premier League. Liverpool were leading at halftime in 69% of their matches in Premier League. 36% of Tottenham’s conceded goals occurred after the 75th minute in Premier League. Liverpool have been undefeated in their last 13 matches in Premier League. AC Milan conceded at least 1 goal in 100% of their home matches in Serie A.
Chievo have failed to win in their last 13 matches in Serie A.
Parma have scored 79% of their goals in the first half in Serie A.
Genoa have failed to win in their last 7 matches in Serie A. AS Roma have scored 32% of their goals after the 75th minute in Serie A.
Inter Milan have scored in each of their last 9 matches in Serie A. 76% of AC Milan’s conceded goals occured in the second half in Serie A.
AC Milan have scored the opening goal in 77% of their matches in Serie A.
AC Milan conceded at least 1 goal in each of their last 6 home matches in Serie A.
Torino conceded at least 1 goal in 83% of their home matches in Serie A. 61% of Torino’s points have been earned away in Serie A.
Chievo have conceded 2 goals or more in each of their last 3 home matches in Serie A.
Lazio have scored in each of their last 5 away matches in Serie A. AS Roma conceded at least 1 goal in 83% of their home matches in Serie A.
Inter Milan have scored in 83% of their away matches in Serie A.
Genoa have scored in 83% of their away matches in Serie A.
Chievo conceded at least 1 goal in 86% of their home matches in Serie A. 80% of Inter Milan’s conceded goals occured in the second half in Serie A.
Genoa conceded at least 1 goal in 100% of their away matches in Serie A.
Chievo have conceded the opening goal in 85% of their matches in Serie A.
Inter Milan have scored the opening goal in 77% of their matches in Serie A. 69% of Genoa’s matches had over 2.5 goals scored in Serie A.
Chievo have failed to win in their last 7 home matches in Serie A.
Inter Milan have scored in each of their last 5 away matches in Serie A.
Genoa conceded at least 1 goal in each of their last 8 matches in Serie A.
Chievo conceded at least 1 goal in each of their last 5 home matches in Serie A.
Inter Milan have scored 40% of their goals after the 75th minute in Serie A.
Chievo have scored 40% of their goals after the 75th minute in Serie A.
Lazio have scored in 83% of their away matches in Serie A.
RB Leipzig did not concede any goal in their last 4 home matches in Bundesliga. Monchengladbach have scored in each of their last 12 matches in Bundesliga. 75% of Frankfurt’s matches had over 2.5 goals scored in Bundesliga. 67% of Wolfsburg’s matches had over 2.5 goals scored in Bundesliga. 83% of B. Monchengladbach’s matches had over 2.5 goals scored in Bundesliga. 50% of Frankfurt’s conceded goals occurred after the 75th minute in Bundesliga. 75% of Wolfsburg’s goals have been scored in the second half in Bundesliga. 29% of B. Monchengladbach’s conceded goals occurred in the first 15 minutes in Bundesliga. Frankfurt have been undefeated in their last 7 matches in Bundesliga. Wolfsburg have scored 31% of their goals after the 75th minute in Bundesliga. Monchengladbach have scored 2 goals or more in each of their last 3 matches in Bundesliga. Frankfurt have scored in each of their last 12 matches in Bundesliga. Monchengladbach have scored in each of their last 6 away matches in Bundesliga. 86% of Frankfurt’s conceded goals occured in the second half in Bundesliga. Monchengladbach have scored the opening goal in 75% of their matches in Bundesliga. Frankfurt were leading at halftime in 58% of their matches in Bundesliga. 79% of B. Monchengladbach’s conceded goals were conceded away in Bundesliga. Frankfurt have scored 2 goals or more in each of their last 3 matches in Bundesliga. Real Betis have scored 38% of their goals after the 75th minute in La Liga. 33% of Atletico Madrid’s conceded goals occurred after the 75th minute in La Liga. FC Barcelona have scored in each of their last 13 matches in La Liga. Real Sociedad have scored 71% of their goals away in La Liga. Girona conceded at least 1 goal in 71% of their home matches in La Liga. Villarreal have scored in each of their last 5 away matches in La Liga. 77% of Real Betis’s goals have been scored in the second half in La Liga. Atletico Madrid have been undefeated in their last 10 matches in La Liga. Girona have scored 69% of their goals in the first half in La Liga. 85% of Atletico Madrid’s matches had under 2.5 goals in La Liga. FC Barcelona have scored 37% of their goals after the 75th minute in La Liga. Villarreal conceded at least 1 goal in each of their last 7 matches in La Liga. 76% of Real Betis’s conceded goals occured in the second half in La Liga. 68% of Real Sociedad’s points have been earned away in La Liga. 73% of Girona’s conceded goals were conceded at home in La Liga. Villarreal have scored in 83% of their away matches in La Liga. 79% of Villarreal’s conceded goals occured in the second half in La Liga. Villarreal have scored 31% of their goals after the 75th minute in La Liga. Real Betis have conceded 2 goals or more in each of their last 4 matches in La Liga. Atletico Madrid have scored 71% of their goals at home in La Liga. FC Barcelona have scored in 100% of their home matches in La Liga. Real Sociedad have scored in 86% of their away matches in La Liga. Atletico Madrid have been undefeated in their last 4 away matches in La Liga. FC Barcelona conceded at least 1 goal in each of their last 11 matches in La Liga. 36% of Villarreal’s conceded goals occurred after the 75th minute in La Liga. Atletico Madrid have drawn their last 3 away matches in La Liga. 69% of FC Barcelona’s matches had over 2.5 goals scored in La Liga. 89% of Atletico Madrid’s conceded goals occured in the second half in La Liga. FC Barcelona conceded at least 1 goal in 86% of their home matches in La Liga. 71% of Atletico Madrid’s points have been earned at home in La Liga. FC Barcelona conceded at least 1 goal in each of their last 6 home matches in La Liga. Toulouse have failed to win in their last 10 matches in Ligue 1. Dijon have failed to win in their last 11 matches in Ligue 1. Marseille have scored 37% of their goals after the 75th minute in Ligue 1. 79% of Reims’s matches had under 2.5 goals in Ligue 1. Toulouse have scored 36% of their goals after the 75th minute in Ligue 1. 61% of Dijon’s conceded goals were conceded at home in Ligue 1. Toulouse conceded at least 1 goal in each of their last 8 matches in Ligue 1. Dijon have scored 42% of their goals after the 75th minute in Ligue 1. 71% of Marseille’s matches had over 2.5 goals scored in Ligue 1. Reims did not concede any goal in 57% of their away matches in Ligue 1. Toulouse conceded at least 1 goal in each of their last 5 home matches in Ligue 1. 75% of Dijon’s goals have been scored in the second half in Ligue 1. 77% of Reims’s conceded goals were conceded away in Ligue 1. Toulouse have failed to win in their last 5 home matches in Ligue 1. 70% of Dijon’s conceded goals occured in the first half in Ligue 1. Reims have scored 30% of their goals in the first 15 minutes in Ligue 1. Toulouse have conceded the opening goal in 71% of their matches in Ligue 1. Dijon were losing at halftime in 64% of their matches in Ligue 1. 73% of Toulouse’s goals have been scored in the second half in Ligue 1. 70% of Bahia’s matches had under 2.5 goals in Serie A (Brazil). Chapecoense have scored 39% of their goals after the 75th minute in Serie A (Brazil). 76% of Cruzeiro’s matches had under 2.5 goals in Serie A (Brazil). 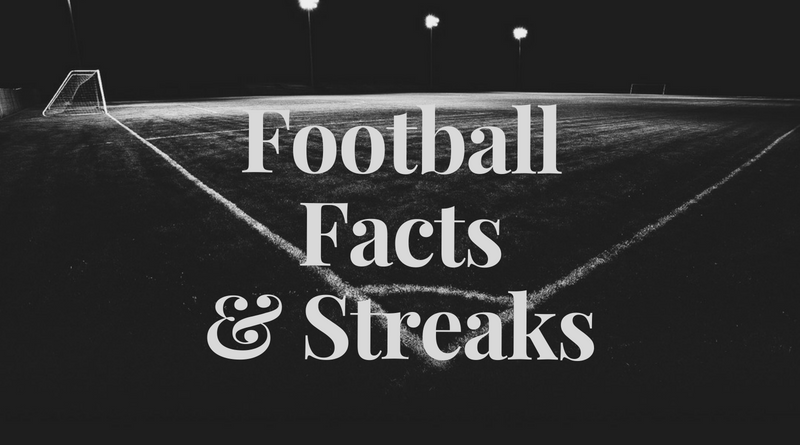 68% of Ceara’s matches had under 2.5 goals in Serie A (Brazil). Corinthians have failed to win in their last 10 away matches in Serie A (Brazil). 77% of Bahia’s points have been earned at home in Serie A (Brazil). Sao Paulo have scored in 78% of their away matches in Serie A (Brazil). 73% of Grêmio’s matches had under 2.5 goals in Serie A (Brazil). Grêmio have scored in each of their last 13 home matches in Serie A (Brazil). Bahia have won their last 4 home matches in Serie A (Brazil). Vasco da Gama have scored 32% of their goals after the 75th minute in Serie A (Brazil). Chapecoense conceded at least 1 goal in 72% of their home matches in Serie A (Brazil). Grêmio have scored 2 goals or more in each of their last 7 home matches in Serie A (Brazil). 72% of Bahia’s goals have been scored in the second half in Serie A (Brazil). 30% of Grêmio’s conceded goals occurred in the first 15 minutes in Serie A (Brazil). 70% of Corinthians’s matches had under 2.5 goals in Serie A (Brazil). Bahia have scored 38% of their goals after the 75th minute in Serie A (Brazil). 76% of Vasco da Gama’s points have been earned at home in Serie A (Brazil). Corinthians have scored 32% of their goals after the 75th minute in Serie A (Brazil). Bristol City have scored 35% of their goals after the 75th minute in Championship. Millwall conceded at least 1 goal in 89% of their home matches in Championship. Bristol City conceded at least 1 goal in 78% of their home matches in Championship. Millwall have scored in 100% of their home matches in Championship. 67% of Bristol City’s matches had under 2.5 goals in Championship. Millwall have failed to win in their last 9 away matches in Championship. 43% of Millwall’s conceded goals occurred after the 75th minute in Championship. Bristol City have lost their last 4 matches in Championship. Millwall have conceded 2 goals or more in each of their last 6 away matches in Championship. Rangers have been undefeated in their last 6 matches in Premiership. Hearts have failed to score in their last 4 matches in Premiership. 36% of Rangers’s conceded goals occurred after the 75th minute in Premiership. Rangers have scored 2 goals or more in each of their last 3 matches in Premiership. Hearts have failed to score in 43% of their home matches in Premiership. Rangers have scored the opening goal in 77% of their matches in Premiership. Rangers were leading at halftime in 69% of their matches in Premiership. Rangers have scored 26% of their goals in the first 15 minutes in Premiership.